I am writing to you today because we have only 6 months left to find a living donor kidney for my husband Gary. Many of you have asked what can you do to help. 1. We will launch our You Tube video this Thursday, telling our story. If anyone would like a copy of our video to show at any event or meeting to help spread the word. 2. We have large Sandwich Boards asking for a donor. If anyone would be willing to volunteer their time to walk a high traffic area wearing the sandwich board. 3. We want to advertise on a Billboard. If anyone has contacts with people who own those advertising billboards. 4. If you are affiliated with a Synagogue or a Church, we can provide you with a packet of information to share with your spiritual community. Even if you are not but you would be willing to help us reach out to faith based groups. 6. If you have any contacts with Deerfield H.S., Glenbrook North High School, Glenbrook South High School and have thoughts about how the high school students and their families could help. 7. Spring To Action – Rally and Canvassing Campaign (Share Your Spare Day) will take place in April or May. If you would like to help organize this event. Certainly hope you will all attend. 8. If you have any Radio, Television or Print contacts. 9. If you want to staff a Gary Table at BJBE. 10. If you Like to Write and would like to write a 2 paragraph story/article to post on our website. 11. If you have any connections with the Rolling Stones. 12. If you have any Airport Advertising contacts. 13. If you belong to a Health Club and would be willing to ask them to display our information we can get you a packet of info. 14. Flash Mob – if you have any interest in organizing a flash mob with the Rolling Stones theme song we are using and film it. 15. 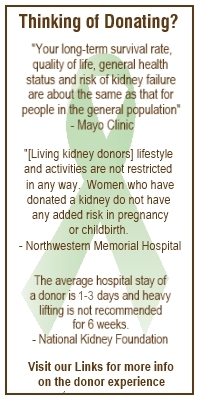 Display Sign – if you are willing to take a sign to a Bulls game or a Blackhawks game to hold up asking for a kidney for Gary. 16. Display Sign Again – if you are willing to take a sign asking for a kidney for Gary and hold it outside of a window of a Major News Station. If you are willing and able to help in any way, please contact Campaign Gary administrative assistant, Marcia Fox (my sister) at sassysisterof3@yahoo.com.